In this issue, we publish the last of the 2015 CSE annual meeting reports. So why take the time to look? The meeting reports are not only a refresher but also a nice distillation of each meeting session. Each report in this issue can serve as a jumping-off point for your own deeper exploration of a topic, such as what to do when an author fails to produce required data, the growing number of ways to understand and present a journal’s impact, ideas for acknowledging the hard work of reviewers, and an authorship framework developed by the Medical Practices in Publishing Initiative to improve transparency in papers stemming from industrysponsored clinical trials. So dig in and discover! This issue tackles some tricky topics. Jaime A Teixeira da Silva and Judit Dobánszki discuss the challenges of handling papers whose authors die during the manuscript submission and publication processes. 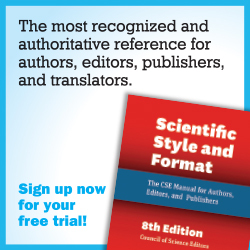 Michelle Yeoman explores unintentional plagiarism and offers tips for editors to help educate authors, reviewers, and others. Her intellectual approach to the topic (as well as an additional column with her personal insight as an educator) is thoughtful and in-depth. We also republish (with a new commentary) a blog post by Stephen B Heard in which he decries the idea that “everything is broken”—and he attempts to provide some perspective. As we begin 2016, here’s a preview of what’s coming for Science Editor. First, I’d like to announce the appointment of Jonathan Schultz to the role of deputy editor. Jonathan serves as the managing editor of Circulation Research, published by the American Heart Association. He is also the CSE web editor, and in 2014, he worked with Amanda Ferguson to develop CSE’s new website. He is the recipient of the 2015 CSE Certificate of Appreciation. Jonathan brings an insightful and strategic perspective to Science Editor, and I’m thrilled to have a new partner in crime. No annual wrap-up would be complete without thanking those who have shared their generosity, talents, ideas, and hard work with Science Editor and with CSE. Where would we be without managing editor Lindsey Buscher and her patience, dedication, and cheer? She’s also the chair of CSE’s Membership Committee and the subject of this month’s Member Profile (and has a few tidbits involving pie charts in store for you in this issue!). I am especially grateful during my first year as a newbie editor-in-chief to have been given help from members of a top-notch, experienced editorial board. Each person has provided me with stories, support, and structure as I’ve learned the ropes. Thanks also to former editor-in-chief and incoming president Patty Baskin, past president Tim Cross, and of course our current president, Angela Cochran, plus Tim Bennett and David Stumph of Kellen Company, for your leadership and encouragement. I’m continually amazed by both Dana Compton and Anna Jester for their tireless energy and contributions, even while juggling meeting plans and several committees. Keeping the engines running on the editing, proofreading, and production front have been Norman Grossblatt, Leslie Neistadt, Caroline Simpson, and Roxanne Young. And to our authors and their words that guide us in our mission—thank you from all of us at Science Editor. Saving the best for last—thanks to Andrew Van Wasshnova, who has deftly handled every request we’ve pitched at him. On a closing note, it’s not too late to get involved in writing or discussing articles for our 2016 focus issue on peer review. In the meantime, we hope you’ll enjoy this issue.